JLC Master Compressor Extreme LAB 2 Exposed! This week is the Salon International de Haute Horlogerie (SIHH) 2010 being held in Geneva, Switzerland. One of the (many) exhibitors of the SIHH is Jaeger-LeCoultre. A watch manufacturer that creates impressive clocks (think Atmos Clock) and timepieces since 177 years. Here at MotoringExposure, we think you should know this company at least for its famous Reverso timepieces. This rectangular watch can be flipped so the dial is being protected from all that is dangerous for a sapphire crystal, but was once meant for polo players to protect their watch. During its whole history of 177 years, Jaeger-LeCoultre has dedicated itself to pushing precision and reliability to the highest possible levels in haute horlogerie. With this expertise, the Manufacture in Switzerland’s Le Sentier uses the SIHH 2010 to launch the new Master Compressor Extreme LAB 2. This is a mechanical chronograph with GMT-function, especially developed for use in the most extreme environments. 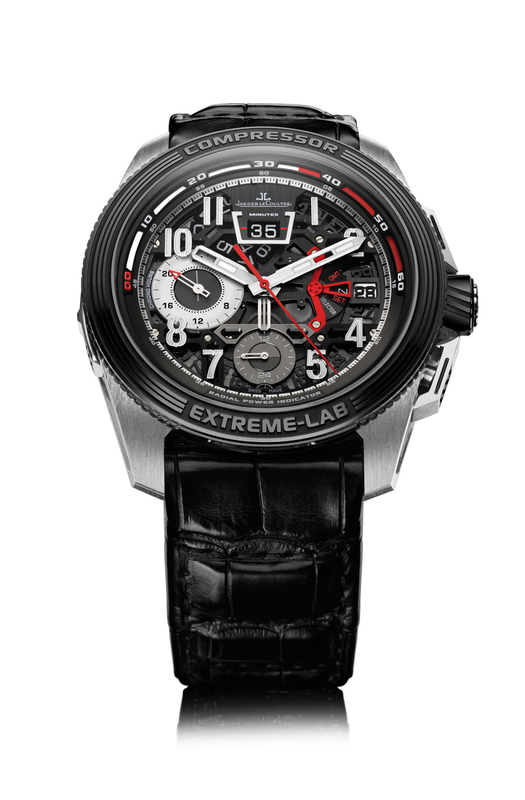 The Master Compressor Extreme Lab 2 combines the sporting spirit with technical prowess for an extreme design. Several new ideas and inventions make the watch very useful for when the going gets tough: An easy to use function selector regulated through the crown, a digital jumping digital minutes counter for superb readability, a chronograph, a power reserve and a GMT-function. Together with scientists, Jaeger-LeCoultre found an innovative way of shielding the going train from magnetic influences. Watch out IWC Ingenieur! The function selector – activated by a pusher in the crown and indicated on the dial – essentially functions like a manual gear box in a car and presents three functions: watch winding in the first position, adjustment of the GMT-function and the date after pushing once, and time setting after a second push. Giving a third push makes the system return to its first position in which the crown is decoupled from the gear train of the watch and only allows winding the watch. This system makes pulling the crown superfluous and therefore protects the watch from possible intrusions of dust and dirt for the crown stays in the same position at all times. It is protected by the two chronograph pushers at the sides and sealed with a double gasket system. The newly developed movement is JLC’s calibre 781, that consists out of 566 parts. Jaeger-LeCoultre claims it to be a precise and reliable movement with chronograph and GMT functions in which the latest of the manufacture’s developments have been incorporated. 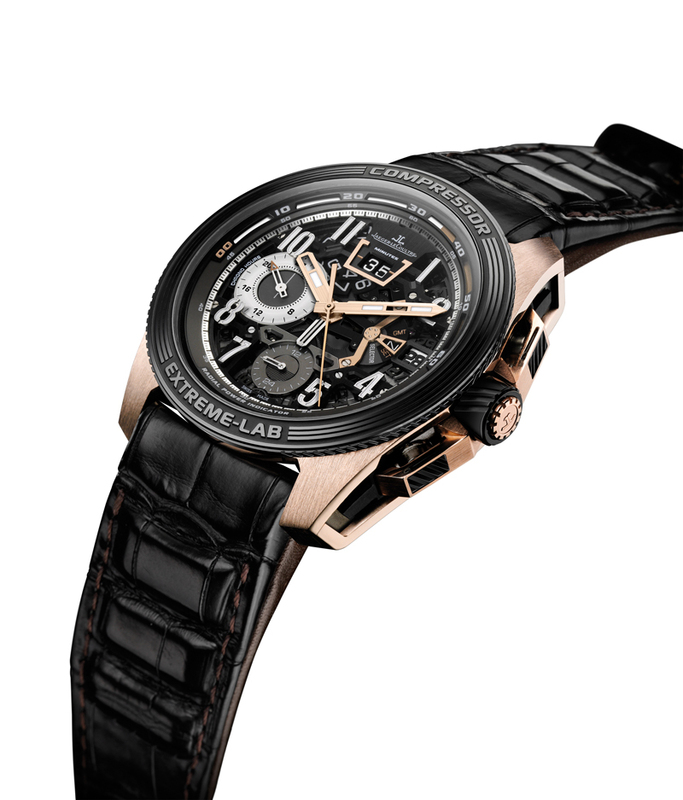 Jaeger-LeCoultre’s Extreme LAB 2 latest measures 46.8mm in diameter and 16.5mm in height. Although some brands introduced a few very thin watches (think Vacheron Constantin and Ralph Lauren’s Slim Classique), there is obviously still a demand for large watches. The watch case is available in a TiVan15 titanium alloy or in 18 carat red gold, sapphire is being used for the front and back crystal and the bezel is made out of black zirconium ceramic, as well as the crown. High-Tech materials for Jaeger-LeCoultre in 2010! No prices available yet, however, don’t worry about it 🙂 It will cost you probably a nice car. Pictures courtesy of Jaeger-LeCoultre. Thanks to Marc Menant of Jaeger-LeCoultre for the update.